The Black Sheep restaurant is just like any other Harvest of Hope customer, except their weekly veg box is gigantic. It’s been almost a year since the family-run local eatery began their partnership with Abalimi Bezekhaya. South African born Chef Japha reveres the opportunity to use seasonal ingredients outside his normal repertoire. His eccentric offerings include deep fried kale, aubergine atchar, kohlrabi kimchi, and an unbeatable turnip and basil combination he credits to his father. “It’s a conscious effort to make very unusual and interesting things,” he said. Chef Japha, whose 25 years of experience spans Michelin star restaurants and high-end gastropubs, seeks out smart combinations. For him that also means locally sourcing ingredients. Japhas philosophy is simple; if it’s imported, he doesn’t buy it. Beyond limiting the restaurant’s carbon footprint, nearby food, he says, “simply tastes better.” Japha heard about Harvest of Hope from indigenous plant expert and Abalimi Friend Loubie Rusch. 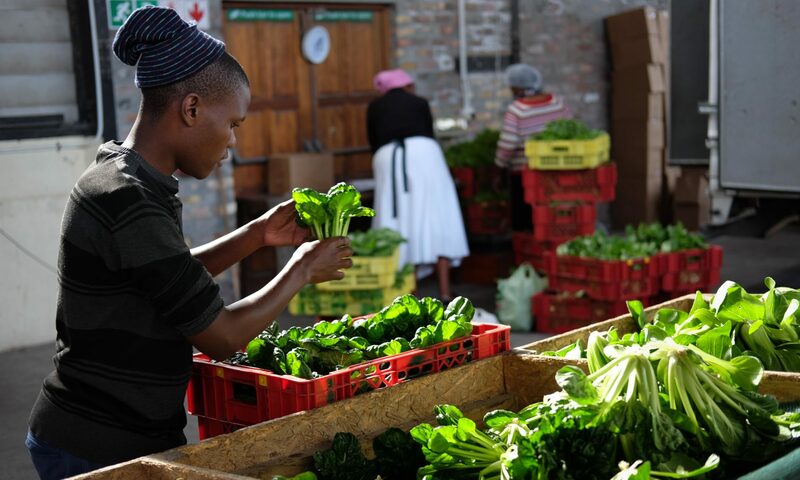 Black Sheep’s entire kitchen staff hail from Khayelitsha, same as many of the farmers from whom they buy their vegetables. Not one attended culinary school, like many of their counterparts at comparable upscale eateries. Their learning-by-doing spirit mirrors that of Abalimi’s farmers, who are constantly mastering new techniques for optimal harvests. You can find The Black Sheep Restaurant at 104 Kloof Street; it’s open Mondays from 18:30, and Tuesdays to Saturdays for lunch and dinner. Reservations are recommended, the earlier the better.